Kenneth G. Libbrecht --Publications, etc. 1. The Snowflake: Winter's Secret Beauty, with photographer Patricia Rasmussen, Voyageur Press, October 2003. 2. The Little Book of Snowflakes, Voyageur Press, October 2004. 3. The Magic of Snowflakes, Voyageur Press, October 2005. 4. Ken Libbrecht's Field Guide to Snowflakes, Voyageur Press, October 2006. 5. The Art of the Snowflake, Voyageur Press, October 2007. 6. Snowflakes, Voyageur Press, October 2008. 7. The Secret Life of a Snowflake, Voyageur Press, January 2010. 8. The Snowflake: Winter's Frozen Artistry, with Rachel Wing, Voyageur Press, October 2015. "Energy Dependence of the Trapping of Uranium Atoms by Aluminum Oxide Surfaces," K. G. Libbrecht, J. E. Griffith, R. A. Weller and T. A. Tombrello, Radiation Effects 49, 195 (1980). "Facular Influences on the Apparent Solar Shape," R. H. Dicke, J. R. Kuhn and K. G. Libbrecht, Nature 304, 326 (1983). "A New Measurement of the Facular Contrast Near the Solar Limb," K. G. Libbrecht and J. R. Kuhn, Astrophys. J. 277, 889 (1984). "Observations on a Solar Latitude-Dependent Limb Brightness Variation," J. R. Kuhn, K. G. Libbrecht and R. H. Dicke, Astrophys. J. 290, 758 (1985). "Oblateness of the Sun in 1983 and Relativity," R. H. Dicke, J. R. Kuhn and K. G. Libbrecht, Nature 316, 22 (1985). "On the Facular Contrast Near the Solar Limb," K. G. Libbrecht and J. R. Kuhn, Astrophys. J. 299, 1047 (1985). "Practical Considerations for the Generation of Large Order Spherical Harmonics," K. G. Libbrecht, Solar Physics 99, 371 (1985). "Solar Ellipticity Fluctuations Yield No Evidence of g-Modes," J. R. Kuhn, K. G. Libbrecht and R. H. Dicke, Nature 319, 128 (1986). "The Variable Oblateness of the Sun - Measurements of 1984," R. H. Dicke, J. R. Kuhn and K. G. Libbrecht, Astrophys. J. 311, 1025 (1986). "Properties of Intermediate-Degree Solar Oscillation Modes," K. G. Libbrecht and H. Zirin, Astrophys. J. 308, 413 (1986). "The Excitation and Damping of Solar Oscillations," K. G. Libbrecht, B. D. Popp, J. M. Kaufman and M. J. Penn, Nature 323, 235 (1986). "Fine Structure in Solar Oscillation Spectra," K. G. Libbrecht, Proceedings of the National Solar Observatory Workshop, The Internal Solar Angular Velocity, B. R. Durney and S. Sofia (eds.) (1986). "Evidence for Global Circulation Currents from Solar-Limb Temperature Variations," J. R. Kuhn, K. G. Libbrecht and R. H. Dicke, Nature 328, 326 (1987). "Is the Solar Oblateness Variable? Measurements of 1985," R. H. Dicke, J. R. Kuhn, and K. G. Libbrecht, Astrophys. J. 318, 451 (1987). "A Search for Radial Velocity Oscillations in Procyon," K. G. Libbrecht, Proceedings of the Symposium 132, High S/N Stellar Spectroscopy (1987). "Solar Interior Structure," K. G. Libbrecht, IAU Commission 12 Report, (1987). "What do the Observations Tell Us About the Excitation of Solar Oscillation Modes?" K. G. Libbrecht, Proceedings of IAU Symposium 123, Advances in Helio- and Asteroseismology (1988). "Frequencies of Solar P-Mode Oscillations," T. L. Duvall, Jr., J. W. Harvey, K. G. Libbrecht, B. D. Popp, M. A. Pomerantz, Astrophys. J. 324, 1158 (1988). "Frequencies of High-Degree Solar P-Mode Oscillations," K. G. Libbrecht and J. M. Kaufman, Astrophys. J. 324, 1172 (1988). "Solar and Stellar Seismology," K. G. Libbrecht, Space Science Reviews 47, 275 (1988). "Solar P-Mode Phenomenology," K. G. Libbrecht, Astrophys. J. 334, 510 (1988). "Radial Velocity Observations Reveal Multimode Oscillations in Gamma Equulei," K. G.Libbrecht, Astrophys. J. Letters, 330, L51 (1988). "The Surface Temperature of the Sun and Changes in the Solar Constant," J. R. Kuhn, K. G. Libbrecht and R. H. Dicke, Science 242, 908 (1988). "The Excitation and Damping of Solar Oscillations (Invited Review)," K. G. Libbrecht, in Seismology of the Sun and Sun-Like Stars, Proceedings of a Symposium held in Tenerife, Spain, 26 - 30 September 1988; ESA SP-286 (1988). "Measurement of Solar Rotation Using High-Degree P-Mode Oscillations," M. F. Woodard and K. G. Libbrecht, in Seismology of the Sun and Sun-Like Stars, Proceedings of a Symposium held in Tenerife, Spain 26 - 30 September 1988; ESA SP-286 (1988). "Solar P-Mode Frequency Splittings," K. G. Libbrecht, in Seismology of the Sun and Sun-Like Stars, Proceedings of a Symposium held in Tenerife, Spain 26 - 30 September 1988; ESA SP-286 (1988). "Solar P-Mode Frequency Splittings," K. G. Libbrecht, Astrophys. J. 336, 1092 (1989). "Seismology of Solar Oscillation Line Widths," J. Christensen-Dalsgaard, D. O. Gough, and K. G. Libbrecht, Astrophys. J. Letters 341, L103 (1989). "The Radial Gradient in the Sun's Rotation," W. A. Dziembowski, P. R. Goode, and K. G. Libbrecht, Astrophys. J. Letters 337, L53 (1989). "Comparison of Solar P-Mode Oscillations in Surface Brightness and Velocity," K. G. Libbrecht, Astrophys. J. 359, 232 (1990). "Observations of Solar Cycle Variations in Solar P-Mode Frequencies and Splittings," K. G. Libbrecht and M. F. Woodard, in Progress of Seismology of the Sun and Stars, Proceedings of the Oji International Seminar, Hakone, Japan (eds. Y. Osaki & H. Shibahashi) (l990). "Frequencies of Solar Oscillations," K. G. Libbrecht, M. F. Woodard, and J. M. Kaufman, Astrophys J. Supp. 74, 1129 (1990). "A Search for an Acoustic Amplitude Deficit at the Antipodes of Sunspots," M. L. Peri and K. G. Libbrecht, Solar Physics 132, 223 (1991). "Short-Term Changes in Solar Oscillation Frequency and Solar Activity," M. F. Woodard, J. R. Kuhn, N. Murray, K. G. Libbrecht, Astrophys. J. Letters 373, L81 (1991). "Is There an Acoustic Resonance in the Solar Chromosphere?" M. F. Woodard and K. G. Libbrecht, Astrophys. J. Letters 374, L61 (1991). "The Solar Rotation," K. G. Libbrecht and C. A. Morrow, in Solar Interior and Atmosphere, A. N. Cox, W. C. Livingston, M. S. Matthews (eds.) (1991). "Nonfacular Solar Luminosity Variations," J. R. Kuhn and K. G. Libbrecht, Astrophys. J. Letters 381, L35 (1991). "Solar Activity and Oscillation Frequency Splittings," M. F. Woodard and K. G. Libbrecht, Astrophys. J. Letters 402, L77 (1993). "Observations of Time Variation in the Sun's Rotation," M. F. Woodard and K. G. Libbrecht, Science 260, 1778 (1993). "The Global Oscillation Network Group Site Survey II. Results," F. Hill, G. Fischer, S. Forgach, J. Grier, J. W. Leibacher, H. P. Jones, P. B. Jones, R. Kupke, R. T. Stebbins, D. W. Clay, R. E. L. Ingram, K. G. Libbrecht, H. Zirin, R. K. Ulrich, L. Webster, L. S. Hieda, B. J. LaBonte, W. M. T. Lu, E. M. Sousa, C. J. Garcia, E. A. Yasukawa, J. A. Kennewell, D. G. Cole, H. Zhen, Xiao S.-M., A. Bhatnagar, A. Ambastha, A. S. Al-Kashlan, M.-S. Abdul-Samad, Z. Benkhaldoun, S. Kadiri, F. Sanchez, P. L. Palle, O. Duhalde, H. Solis, O. Saa, and R. Gonzalez, Solar Physics 152, 351 (1994). "A Fiber-Fed Echelle Spectrograph for the Hale 5-Meter Telescope," K. G. Libbrecht and M. L. Peri, Publications of the Astronomical Society of the Pacific 107, 62 (1995). "Creating Long-Lived Neutral Atom Traps in a Cryogenic Environment," P. A. Willems and K. G. Libbrecht, Phys. Rev A 51, 1403 (1995). "Teaching Physics with 670 nm Diode Lasers -- Construction of Stabilized Lasers and Lithium Cells," K. G. Libbrecht, R. A. Boyd, P. A. Willems, T. L. Gustavson, and D. K. Kim, Am. J. Phys. 63, 729 (1995). "The Solar Acoustic Spectrum and Eigenmode Parameters," F. Hill, P. B. Stark, T. Stebbins, E. R. Anderson, H. M. Antia, T. M. Brown, T. L. Duvall Jr., D. A. Haber, J. W. Harvey, D. H. Hathaway, R. Howe, R. P. Hubbard, H. P. Jones, J. R. Kennedy, S. G. Korzennik, A. G. Kosovichev, J. W. Leibacher, K. G. Libbrecht, J. A. Pintar, E. J. Rhodes Jr., J. Schou, M. J. Thompson, S. Tomczyk, C. G. Toner, R. Toussaint, W. E. Williams, Science 272, 1292 (1996). "Spatial Dependence of Solar-Cycle Changes in the Sun's Luminosity," S. F. Taylor, J. R. Varsik, M. F. Woodard, and K. G. Libbrecht, Solar Physics 178, 1 (1997). "Cloud Chambers and Crystal Growth: Effects of Electrically Enhanced Diffusion on Dendrite Formation from Neutral Molecules," K. G. Libbrecht and V. M. Tanusheva, Phys. Rev. E 59, 3253 (1999). Comment on "Electrically Induced Morphological Instabilities in Free Dendrite Growth" -- Libbrecht and Tanusheva reply, K. G. Libbrecht and V. M. Tanusheva, Phys. Rev. Lett 83, 1699 (1999). "A Cylindrically Symmetric Green's Function Approach for Modeling the Crystal Growth Morphology of Ice," K. G. Libbrecht, Phys. Rev. E 60, 1967 (1999). "LIGO: Hearing the Gravitational-Wave Universe," K. G. Libbrecht, Mercury magazine, Vol. 30, #5, Sept/Oct 2001. "Origin of Irradiance Variations from Disk Photometer Data," M. F. Woodard and K. G. Libbrecht, Proc. of SOHO 12/GONG+ 2002 (2002). "Spatial and Temporal Variations in the Solar Brightness," M. F. Woodard and K. G. Libbrecht, Solar Physics 212, 51 (2003). "Generation of an Intense Cold Atom Beam from a Pyramidal Magneto-optical Trap: Experiment and Simulation," J. Kohel, J. Rairez-Serrano, R. J. Thompson, L. Maleki, J. L. Bliss, and K. G. Libbrecht, J. Opt. Soc. Am. B20, 1161 (2003). "A Search of CO Absorption in the Transmission Spectrum of HD 209458 b," T. M. Brown, K. G. Libbrecht, and D. Charbonneau, Pub. Astron. Soc. Pacific 114, 826 (2002). "Evolution of the Sun's Near-surface Asphericities over the Activity Cycle," P. R. Goode, L. V. Didkovsky, K. G. Libbrecht, and M. F. Woodard, Advances in Space Research 29, 1889 (2002). CBS Evening News aired a 2-minute piece on January 10, 2004, featuring KGL's snowflake science. "A Basic Lock-in Amplifier Experiment for the Undergraduate Laboratory," K. G. Libbrecht, E. D. Black, and C. M. Hirata, Am. J. Phys. 71, 1208 (2003). "An Investigation of Laboratory-grown Ice Spikes," K. G. Libbrecht and K. Lui, J. Glaciology 50, 371 (2004). View pdf. "Enhanced photothermal displacement spectroscopy for thin-film characterization using a Fabry-Perot resonator," E. D. Black, I. S. Grudinin, S. R. Rao, and K. G. Libbrecht, J. Appl. Phys. 95, 7655 (2004). "Toward Quantum-Limited Position Measurements Using Optically Levitated Microspheres," K. G. Libbrecht and E. D. Black, Physics Letters A 321, 99 (2004). View pdf. "Direct Observation of Broadband Coating Thermal Noise in a Suspended Interferometer," Eric D. Black, Akira Villar, Kyle Barbary, Adam Bushmaker, Jay Heefner, Seiji Kawamura, Fumiko Kawazoe, Luca Matone, Sharon Meidt, Shanti R. Rao, Kevin Schulz, Michael Zhang, Kenneth G. Libbrecht, Physics Letters A 328, 1 (2004). "Why Caltech will be a Better Place when Freshmen can Choose Avery House," by the Avery Council, The California Tech, April 17, 2004. "The Many Facets of Ice," K. G. Libbrecht, Contemp. Phys. 45, 433 (2004). "Snowflakes: Up Close and Personal," by K. G. Libbrecht, Cross Country Skier, November 2004. "Thermoelastic-damping Noise from Sapphire Mirrors in a Fundamental-noise-limited Interferometer," Eric D. Black, Akira Villar, and Kenneth G. Libbrecht, Phys. Rev. Lett. 93, 241101 (2004). "Snowflake Science," K. G. Libbrecht, American Educator, Winter 2004-5. "Macroscopic Coherence Effects in a Mesoscopic System: Weak Localization of Thin Silver Films," A.D. Beyer, M. Koesters, K. G. Libbrecht, and E. D. Black, Am. J. Phys. 73, 1014 (2005). "Precision Measurements of Ice Crystal Growth Rates," K. G. Libbrecht, paper arXiv:cond-mat/0608694 at the arXiv.org e-Print archive (2006). View pdf. "Interferometric measurement of the resonant absorption and refractive index in rubidium gas," K. G. Libbrecht and M. W. Libbrecht, Am. J. Phys. 14, 1055-60 (2006). "Modeling Diffusion-Limited Crystal Growth from Vapor using a Commercial Finite-Element Analysis Code," paper arXiv:cond-mat/0610584 at the arXiv.org e-Print archive (2006). "A Flurry of Snowflake Stamps," K. G. Libbrecht, Philatelia Chimica at Physica, 29, No. 2 (2007). "The Formation of Snow Crystals," K. G. Libbrecht, American Scientist 95, 52-59 (2007). View pdf. "The Enigmatic Snowflake," Physics World, Jan. 2008. View pdf. "Physically Derived Rules for Simulating Faceted Crystal Growth using Cellular Automata," K. G. Libbrecht, paper arXiv:0807.2616 at the arXiv.org e-Print archive (2008). View pdf. "A Basic Thermodynamic Derivation of the Maximum Overburden Pressure Generated in Frost Heave," K. G. Libbrecht, paper arXiv:0808.2488 at the arXiv.org e-Print archive (2008). View pdf. "Observations of an Impurity-driven Hysteresis Behavior in Ice Crystal Growth at Low Pressure," K. G. Libbrecht, paper arXiv:0809.4863 at the arXiv.org e-Print archive (2008). View pdf. "A Convection Chamber for Measuring Ice Crystal Growth Dynamics," K. G. Libbrecht and H. C. Morrison, paper arXiv:0809.4869 at the arXiv.org e-Print archive (2008). View pdf. "Crystal Growth in the Presence of Surface Melting and Impurities: An Explanation of Snow Crystal Growth Morphologies," K. G. Libbrecht, paper arXiv:0810.0689 at the arXiv.org e-Print archive (2008). View pdf. "Measurements of Snow Crystal Growth Dynamics in a Free-fall Convection Chamber," K. G. Libbrecht, H. C. Morrison and B. Faber, paper arXiv:0811.2994 at the arXiv.org e-Print archive (2008). View pdf. "Aerodynamic Stability and the Growth of Triangular Snow Crystals," K. G. Libbrecht and H. M. Arnold, arXiv:0911.4267v1 (2009). View pdf. "Aerodynamical Effects in Snow Crystal Growth," K. G. Libbrecht, arXiv:0911.4733v1 (2009). View pdf. "Measurements of Ice Crystal Growth Rates in Air at -5C and -10C," K. G. Libbrecht and H. M. Arnold, arXiv:0912.2518v1 (2009). View pdf. "Identification of a Novel "Fishbone" Structure in the Dendritic Growth of Columnar Ice Crystals," K. G. Libbrecht, arXiv:0912.2522v1 (2009) View pdf. “A versatile thermoelectric temperature controller with 10 mK reproducibility and 100 mK absolute accuracy,” K. G. Libbrecht and A. W. Libbrecht, Rev. Sci. Instr. 80, 126107 (2009). “Measurement of thermal noise in multilayer coatings with optimized layer thickness,” A. E. Villar et al., Phys. Rev. D 81, 122001 (2010). “Snow surprises on crystals,” K. Libbrecht, Chem. & Ind. 24, 10 (2010). “Chemical Influences on Ice Crystal Growth from Vapor,” Kenneth G. Libbrecht and Robert Bell, arXiv:1101.0127 (2011). “An Improved Apparatus for Measuring the Growth of Ice Crystals from Water Vapor,” Kenneth G. Libbrecht, arXiv:1109.1511 (2011). “Measurements of Growth Rates of (0001) Ice Crystal Surfaces,” K. G. Libbrecht and M. E. Rickerby, arXiv:1110.5828 (2011). “Observations of an Edge-enhancing Instability in Snow Crystal Growth near -15 C,” Kenneth G. Libbrecht, arXiv:1111.2786 (2011). “Response to "Comment on 'A versatile thermoelectric temperature controller with 10 mK reproducibility and 100 mK absolute accuracy"' [Rev. Sci. Instrum. 80, 126107 (2009)],” K. G. Libbrecht and A. W. Libbrecht, Rev. Sci. Instr. 82, 027102 (2011). 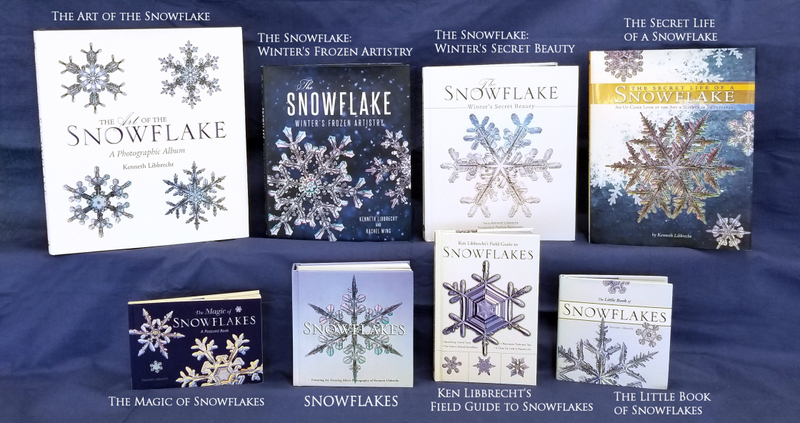 “Kenneth Libbrecht The snowflake designer,” J. Hoffman and K. Libbrecht, Nature 480, 453-454 (2011). “On the Equilibrium Shape of an Ice Crystal,” Kenneth G. Libbrecht. 1205.1452 (2012). “Managing Systematic Errors in Ice Crystal Growth Experiments,” Kenneth G. Libbrecht, arXiv:1208.5064 (2012). “Crystal Growth in the Presence of Surface Melting: Novel Behavior of the Principal Facets of Ice,” K. G. Libbrecht and M. E. Rickerby, arXiv:1208.5982 (2012). “An Edge-Enhancing Crystal Growth Instability Caused by Structure-Dependent Attachment Kinetics," Kenneth G. Libbrecht,” arXiv:1209.4932 (2012). “Toward a Comprehensive Model of Snow Crystal Growth Dynamics: 1. Overarching Features and Physical Origins,” Kenneth G. Libbrecht, arXiv:1211.5555 (2012). “Toward a Comprehensive Model of Snow Crystal Growth Dynamics: 2. Structure Dependent Attachment Kinetics near -5 C, Kenneth G. Libbrecht,” arXiv:1302.1231 (2013). “Measurements of surface attachment kinetics for faceted ice crystal growth,” K. G. Libbrecht and M. E. Rickerby, J. Cryst. Growth 377, 1-8 (2013). “A Dual Diffusion Chamber for Observing Ice Crystal Growth on c-Axis Ice Needles,” Kenneth G. Libbrecht, arXiv:1405.1384 (2014). “A Laser Interferometer for the Undergraduate Teaching Laboratory Demonstrating Picometer Sesitivity,” Kenneth G. Libbrecht and Eric D. Black, arXiv:1407.0075 (2014). “Toward a Comprehensive Model of Snow Crystal Growth: 3. The Correspondence Between Ice Growth from Water Vapor and Ice Growth from Liquid Water,” Kenneth G. Libbrecht, arXiv:1407.0740 (2014). “Particle Dynamics in Damped Nonlinear Quadrupole Ion Traps,” Eugene A. Vinitsky, Eric D. Black, Kenneth G. Libbrecht, arXiv:1409.6262 (2014). “Material loss angles from direct measurements of broadband thermal noise,” M. Principe et al., Phys. Rev. D 91, 022005 (2015). “An experimental apparatus for observing deterministic structure formation in plate-on-pedestal ice crystal growth,” Kenneth G. Libbrecht, arXiv:1503.01019 (2015). “Incorporating Surface Diffusion into a Cellular Automata Model of Ice Growth from Water Vapor,” Kenneth G. Libbrecht, arXiv:1509.08543 (2015). “Toward a Comprehensive Model of Snow Crystal Growth: 4. Measurements of Diffusion-limited Growth at -15 C,” Kenneth Libbrecht, Christopher Miller, Ryan Potter, Nina Budaeva, Cameron Lemon and Sarah Thomas, arXiv:1512.03389 (2015). “The Surface Diffusion Length of Water Molecules on Faceted Ice: A Reanalysis of "Roles of Surface/Volume Diffusion in the Growth Kinetics of Elementary Spiral Steps on Ice Basal Faces Grown from Water Vapor", by Asakawa et al.,” Kenneth G. Libbrecht, arXiv:1509.06609 (2015). “Particle dynamics in damped nonlinear quadrupole ion traps,” E. A. Vinitsky, E. D. Black, and K. G. Libbrecht, Am. J. Phys. 83, 313-319 (2015). “A basic Michelson laser interferometer for the undergraduate teaching laboratory demonstrating picometer sensitivity,” K. G. Libbrecht and E. D. Black, Am. J. Phys. 83, 409-417 (2015). “Measurements of Cylindrical Ice Crystal Growth Limited by Combined Particle and Heat Diffusion,” Kenneth G. Libbrecht, arXiv:1602.02683 (2016). “Toward a Comprehensive Model of Snow Crystal Growth: 5. Measurements of Changes in Attachment Kinetics from Background Gas Interactions at -5 C,” Kenneth G. Libbrecht, arXiv:1602.08528 (2016). “Physical Dynamics of Ice Crystal Growth,” K. G. Libbrecht (invited review), Ann. Rev. Mater. Res. 47, 271-295 (2017). “Improved microparticle electrodynamic ion traps for physics teaching,” K. G. Libbrecht and E. D. Black, Am. J. Phys. 86, 539-49 (2018). "Detector Description and Performance for the First Coincidence Observations Between LIGO and GEO", Nucl. Instr Methods. A, Vol. 517/1-3, pp. 154-179 (2004). "Setting upper limits on the strength of periodic gravitational waves from PSR J1939+2134 using the first science data from the GEO 600 and LIGO detectors", Phys. Rev. D 69, 082004 (2004). "First upper limits from LIGO on gravitational wave bursts," Phys. Rev. D 69, 102001 (2004). "Analysis of LIGO data for gravitational waves from binary neutron stars," Phys. Rev. D 69, 122001 (2004). "Analysis of first LIGO science data for stochastic gravitational waves," Phys. Rev. D 69, 122004 (2004). "Analysis of LIGO data for gravitational waves from binary neutron stars," Phys. Rev. D 69, 122001(2004). "Limits on gravitational-wave emission from selected pulsars using LIGO data," Phys. Rev. Lett. 94, 181103 (2005). "Search for gravitational waves associated with the gamma ray burst GRB030329 using the LIGO detectors," Phys. Rev. D 72, 042002 (2005). "Upper limits on gravitational wave bursts in LIGO's second science run," Phys. Rev. D 72, 062001 (2005). "Search for gravitational waves from primordial black hole binary coalescences in the galactic halo," Phys. Rev. D 72, 082002 (2005). "Search for gravitational waves from galactic and extra-galactic binary neutron stars," Phys. Rev. D 72, 082001 (2005). "Upper limits on a stochastic background of gravitational waves," Phys. Rev. Lett. 95, 221101 (2005). "First all-sky upper limits from LIGO on the strength of periodic gravitational waves using the Hough transform," Phys. Rev. D 72, 102004 (2005). "Upper limits from the LIGO and TAMA detectors on the rate of gravitational-wave bursts," Phys. Rev. D 72, 122004 (2005). "Search for gravitational waves from binary black hole inspirals in LIGO data," Phys. Rev. D 73, 062001 (2006). "Search for gravitational-wave bursts in LIGO's third science run," Classical and Quant. Grav. 23, S29-S39 Sp. Iss. SI (2006). "Joint LIGO and TAMA300 search for gravitational waves from inspiralling neutron star binaries," Phys. Rev. D 73, 102002 (2006). "Searching for a stochastic background of gravitational waves with the laser interferometer gravitational-wave observatory," Ap. J. 659, 918-930 (2007). "Search for gravitational wave radiation associated with the pulsating tail of the SGR 1806 20 hyperflare of 27 December 2004 using LIGO," Phys. Rev. D 76, 062003 (2007). "Upper limit map of a background of gravitational waves," Phys. Rev. D 76, 082003 (2007). "Searches for periodic gravitational waves from unknown isolated sources and Scorpius X-1: Results from the second LIGO science run," Phys. Rev. D 76, 082001 (2007). "Search for gravitational-wave bursts in LIGO data from the fourth science run," Classical and Quant. Grav. 24, 5343-5369 (2007). "All-sky search for periodic gravitational waves in LIGO S4 data," Phys. Rev. D 77, 022001 (2008). "Upper limits on gravitational wave emission from 78 radio pulsars," Phys. Rev. D 77, 069905 (2008). "First cross-correlation analysis of interferometric and resonant-bar gravitational-wave data for stochastic backgrounds," Phys. Rev. D 77, 069904 (2008). "Upper limit map of a background of gravitational waves," Phys. Rev. D 77, 069903 (2008). "All-sky search for periodic gravitational waves in LIGO S4 data," Phys. Rev. D 77, 069902 (2008). "Search for gravitational waves associated with 39 gamma-ray bursts using data from the second, third, and fourth LIGO runs," Phys. Rev. D 77, 062004 (2008). "Search for gravitational waves from binary inspirals in S3 and S4 LIGO data," Phys. Rev. D 77, 062002 (2008). "A joint search for gravitational wave bursts with AURIGA and LIGO," Classical and Quant. Grav. 25, 095004 (2008). "Astrophysically triggered searches for gravitational waves: status and prospects," Classical and Quant. Grav. 25, 114051 (2008). "Implications for the origin of GRB 070201 from LIGO observations," Ap. J. 681, 1419-1430 (2008). "Beating the spin-down limit on gravitational wave emission from the Crab pulsar," Ap. J. Lett. 683, L45-L49 (2008). "Search of S3 LIGO data for gravitational wave signals from spinning black hole and neutron star binary inspirals," Phys. Rev. D 78, 042002 (2008). "Search for gravitational-wave bursts from soft gamma repeaters," Phys. Rev. Lett. 101, 211102 (2008). "First joint search for gravitational-wave bursts in LIGO and GEO 600 data," Classical and Quant. Grav. 25, 245008 (2008). "Einstein@Home search for periodic gravitational waves in LIGO S4 data," Phys. Rev. D 79, 022001 (2009). "Observation of a kilogram-scale oscillator near its quantum ground state," New J. Phys. 11, 073032 (2009). "Beating the spin-down limit on gravitational wave emission from the Crab pulsar," Ap. J. Lett. 706, L203 (2009). ”All-sky search for periodic gravitational waves in LIGO S4 data,” Phys. Rev. D 80, 129904 (2009). “Search for gravitational wave ringdowns from perturbed intermediate mass black holes in LIGO-Virgo data from 2005-2010,” Phys. Rev. D 80, 102006 (2014). “The NINJA-2 project: detecting and characterizing gravitational waveforms modelled using numerical binary black hole simulations,” Class. Quant. Grav. 31, 115004 (2014). “Search for gravitational radiation from intermediate mass black hole binaries in data from the second LIGO-Virgo joint science run,” Phys. Rev. D 89, 122003 (2014). “Methods and results of a search for gravitational waves associated with gamma-ray bursts using the GEO 600, LIGO, and Virgo detectors,” Phys. Rev. D 89, 122004 (2014). “Search for Gravitational Waves Associated with gamma-ray Bursts Detected by the Interplanetary Network,” Phys. Rev. Lett. 113, 011102 (2014). “Implementation of an F-statistic all-sky search for continuous gravitational waves in Virgo VSR1 data,” Class. Quant. Grav. 31 165014 (2014). “First all-sky search for continuous gravitational waves from unknown sources in binary systems, Phys. Rev. D 90, 6 (2014). “Multimessenger search for sources of gravitational waves and high-energy neutrinos: Initial results for LIGO-Virgo and IceCube,” Phys. Rev. D 90, 102002 (2014). “Improved Upper Limits on the Stochastic Gravitational-Wave Background from 2009-2010 LIGO and Virgo Data,” Phys. Rev. Lett. 113, 231101 (2014). “Narrow-band search of continuous gravitational-wave signals from Crab and Vela pulsars in Virgo VSR4 data,” Phys. Rev. D 91, 022004 (2015). “Directed search for gravitational waves from Scorpius X-1 with initial LIGO data,” Phys. Rev. D 91, 062008 (2015). “Advanced LIGO,” Class. Quant. Grav. 32, 074001 (2015). “Searches for continuous gravitational waves from nine young supernova remnants,” Astrophys. J. 819, 39 (2015).